Live blog on RTÉ.ie and the RTÉ News Now App from 6.30pm on Saturday and 12.30pm on Sunday. 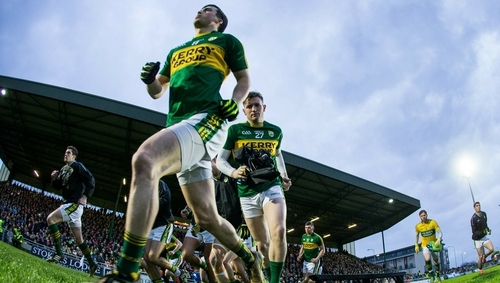 Saturday: Watch Kerry v Dublin on Saturday GAA Live on RTÉ2 and the RTÉ Player from 6.30pm - also live on eir sport 1. Mayo v Cavan live on eir sport 2. Sunday: Monaghan v Galway live on TG4 from 1.30pm. Deferred showing of Roscommon v Tyrone from 3.45pm and Clare v Cork from 5.15pm on TG4. Highlights of all the weekend's action on Allianz League Sunday on RTÉ2 and the RTÉ Player on Sunday, 9.30pm. Saturday: Winds gradually abating on Saturday with good sunshine and just scattered showers, these mainly confined to Ulster and north Connacht. However, there is the risk of rain moving into southern counties later in the day. Highest temperatures of 5 to 9 degrees in moderate to fresh westerly breezes. Sunday: Any rain or sleet will clear from the south coast to leave a chilly, bright day with sunny spells and a few showers. The showers will become frequent in Ulster later in the day, some with hail and thunder. Maximum temperatures of 5 to 8 degrees in moderate northwest winds. For more go to met.ie. Dress rehearsal for bigger games to come? From once the fixtures were made, the meeting of Kerry and Dublin in Tralee was a pairing that stood out - a significant early test for Peter Keane's Kingdom project. So far, Keane's troops, while not overly free-flowing, show a doggedness and a desire that saw them get the better of Tyrone. And then last Sunday against Cavan, caution was very much their approach in the opening half at Breffni. Once possession was lost, they would scurry back to defend, leaving few options up front. With the wind on their backs for the second half, the applied more pressure and reaped the benefits as the hosts flagged. Seán O’Shea knocked over 0-12, with ten of those coming from placed balls. "We have been under fierce pressure with players and numbers and trying to get bodies back on the field. "I won't complain [with two wins], but at the same time we won't be getting carried away with it." Of course, for a manager to play things down is nothing new, but taking the Dubs scalp on Saturday evening would be a huge feather in the cap for Kerry's new management. With a stronger squad at their disposal for the remainder of the league, they would surely have one eye then on reaching the divisional final. As for the Dubs, they registered their first win of the win when accounting for Galway at Croke Park. Jim Gavin's side didn't take the lead until the 30th minute but remained in pole position from there on, dominating the second-half to bounce back from their loss in Monaghan. Cormac Costello was the standout performer with 0-06 in a game where Gavin handed out three debuts, starting Liam Flatman and Sean Bugler, while the highly-regarded midfielder Darren Gavin came on in the second half. Dublin's strength in depth is greater as of now though Kerry you would have to say possess a more potent inside forward line. We won't talk about the 'drive for five', but Tralee on Saturday evening in February could be the start of something really compelling between these old foes in the months ahead. "63% of games so far have been decided by a single score. That stat illuminates a reality that these seven rounds of league football are the most compelling and entertaining games of the inter-county year. Last year while in charge of Westport, James Horan worked with Fionn McDonagh and with telling effect the latter made his mark in the county jersey as Mayo turned in the most eye-catching display of round two. McDonagh bagged 1-03 as the Green and Red made light work of the Tyrone challenge in Omagh. His goal was dispatched with no little authority and with Ciaran Treacy ably assisting him in the half-forward line, the early signs are good for Mayo, with Ciaran Whelan quick to praise the Connacht men on Allianz League Sunday. "It was the best we’ve seen from any team in the league so far. From a Mayo perspective they will be really happy that they were solid defensively, attacking from deep. Horan's men will fancy taking two more points at home to Cavan. If they do, they'll avoid any relegation scrap at the end of March. Another Westport player in the shape of Colm Moran will make his league debut against the Breffni.